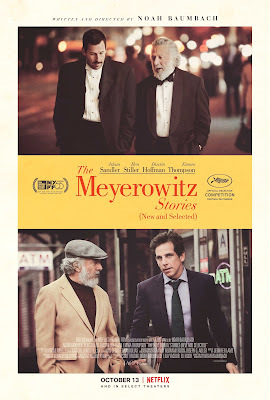 Review | "The Meyerowitz Stories (New and Selected)"
(Left to right) Ben Stiller and Dustin Hoffman in Director Noah Baumbach’s THE MEYEROWITZ STORIES (NEW AND SELECTED) to be released by Netflix. Few filmmakers portray family dysfunction quite so incisively as Noah Baumbach; whose acerbic wit and dark view of human nature have resulted in some of the most painfully hilarious portraits of stunted emotional growth and families in decline in recent memory. His latest film, The Meyerowitz Stories (New and Selected) is perhaps his most humane work yet, adding layers of emotion and regret that permeate his typically acidic dialogue. The family in question here, the eponymous Meyerowitzes, are lorded over by patriarch Harold (Dustin Hoffman), an artist of mild repute who now spends his days as a professor at a New York University. 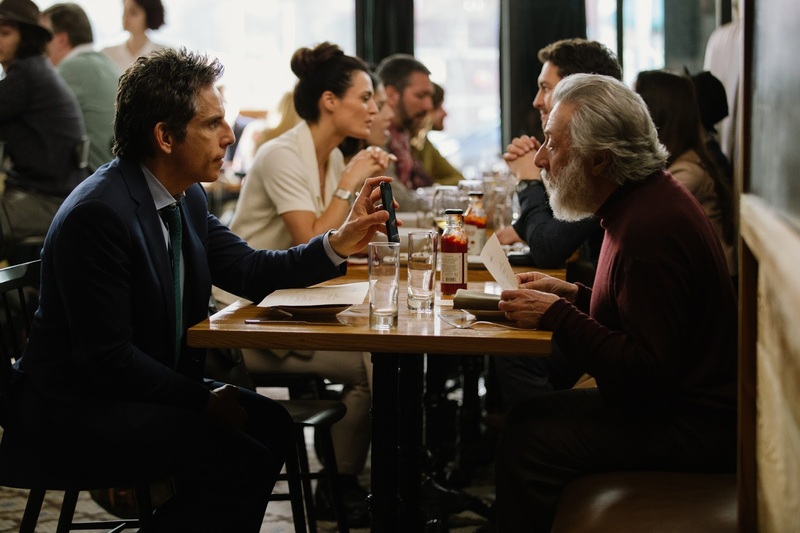 Troubled by his lack of success, Harold lives vicariously through his children, Matthew (Ben Stiller), Danny (Ben Stiller), and Jean (Elizabeth Marvel), each a disappointment in their own way. Danny and Jean both had artistic tendencies, but failed to really pursue them; while Danny's daughter, Eliza (Grace Van Patten), makes pretentious, borderline pornographic student films at her film school. Matthew is the only one who became financially successful by going into business, a fact for which Harold simultaneously loves and resents him for. They all find themselves together after an unexpected brain ailment leaves Harold incapacitated, forcing them to confront their demons and come to terms with their past. The Meyerowitz Stories is arguably Baumbach's finest work since The Squid and the Whale. There's a certain air of melancholy that hangs over the film, permeating every frame with a sense of missed opportunity and a lifetime of buried feelings. The character relationships have a sense of history, built on shared pain and things left unsaid. Harold Meyerowitz is one of Baumbach's most indelible creations, a lovable curmudgeon who is both arrogant and trapped by his own sense of failure an inadequacy, qualities he then projects onto his offspring in an attempt to make up for his own shortcomings. This is the kind of character Baumbach writes so well, yet you never feel the sociopathinc detachment one feels in similar characters from Squid or Margot at the Wedding. Harold isn't lashing out at those he loves, or using them to build himself up, he's simply using them as conduits for his own self-loathing. He may be selfish, but he isn't intentionally cruel. "If he's not a great artist, then he's just a prick," Danny opines at an art show celebrating his father. In that moment, he captures the haunting, painful beauty of The Meyerowitz Stories. It's as much about old men facing their legacies as it is about their descendants grappling with what that legacy means to them. They are that legacy, and coming to grips with who that makes them, not just as an individual but as part of a tapestry whose threads are inseparable from one another, is a key part of achieving emotional maturity. Baumbach's characters haven't reached that level yet; but in this, his most gentle film, they're imperfectly lurching toward a state of, if not maturity, then at least a kind of grudging acceptance of who they really are. THE MEYEROWITZ STORIES (NEW AND SELECTED) | Directed by Noah Baumbach | Stars Adam Sandler, Ben Stiller, Dustin Hoffman, Emma Thompson, Elizabeth Marvel, Grace Van Patten, Candice Bergen, Judd Hirsch, Rebecca Miller | Not rated | Now playing on Netflix and in select theaters.